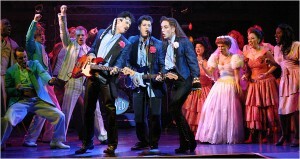 I appeared in The Wedding Singer back in 2011. Costume – Shoulderpads at the ready – 1980’s!!! Technical – 1980’s moving lights are go!! This is a fun show set in the 1980’s and based on the movie of the same name. The music is really fun with a few songs taken from the movie and the rest of it an original score. There are some great leads in this show and it tells the story of Robbie, a wedding singer, who gets dumped at the aisle and how he comes to fall for his friend Julia. There are all sorts of leads. For the boys – Robbie – the lead has to have a solid pop voice and good comedy timing, Sammy – he is in the band with Robbie, good harmonies needed and like Robbie a strong pop voice with good comedy is essential, George – you have to have an extrovert for this part as he is essentially a Boy George wannabe and finally Glen, the baddie of the show who needs swagger. For the girls – Julia- sweet girl next door, Holly – Julia’s slutty best friend with a big belt voice; Rosie- Robbie’s grandmother with a great comedy part and Linda – Robbie’s ex fiance who has 2 showstopping numbers, again requiring a big belt voice. It is important to bear in mind that all of the leads need a pop voice and some with good belts. Therefore if your company is mainly made up of classical singers it may not be the show for you. This show has more cameos than any other show I know. The cameos range from those with just a line to a few small singing parts and a lot of them are great fun to play including Cindi Lauper and a bride who gets her wedding ruined by Robbie. If you want to give members of the ensemble something to do and you have an ensemble strong enough to carry off these additional parts then it could be a great choice. This is one of the shows that can have a massive moving hired set or it can be done cheaply with a few items such as toilets stalls and sinks coming in/out as appropriate. This is such a fun show to costume and it doesn’t have to cost a fortune if you raid charity shops and e-bay. The only thing that may be a little pricey to costume is the numerous 1980’s wedding dresses in the show. The Wedding Singer is aided by a great lighting rig and/or a talented lighting designer to add to the 1980’s vibe of this show. The show is scored for 12 with a great rock/pop vibe to a lot of the music. The choreographer has numerous numbers to work on in this show. Someone who is good a up tempo numbers would be perfect. This show could be a popular choice with the audience as it is very closely based on the film. The popularity of the show may depend on your target audience. This should go down well with a younger audience and an audience who appreciates comedy. If you are looking for a show that is fun to do and that will have you laughing throughout the rehearsal period then this is a good choice. You need to have a company that does have younger members (although plenty for all ages) and a younger following. Importantly you need a company that is strong enough to carry not only the leads but the numerous cameo roles. If you do this is a show that you inject a lot of colour and fun as well as giving lots for all to do.